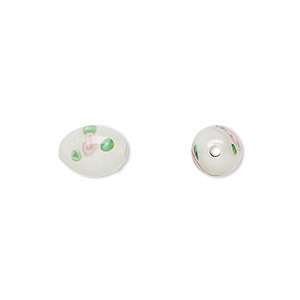 Bead, Czech lampworked glass, opaque white / pink / green, 12x8mm-13x9mm olive with flower design. Sold per pkg of 4. Item Number: H20-3489GB Have a question about this item? Glassworkers have embedded a beautiful rose into each side of these gorgeous lampworked beads. Size and shape may vary slightly and color may vary from dye lot to dye lot. Items are made with solid color glass, which means the base color of the glass is saturated throughout the object and will not fade or rub off over time. Bead, Czech lampworked glass, opaque green and pink, 9x6mm-10x7mm olive with flower design. Sold per pkg of 4. Bead, Czech lampworked glass, opaque purple / pink / green, 12x8mm-13x9mm olive with flower design. Sold per pkg of 4. Bead, Czech lampworked glass, opaque black / pink / green, 12x8mm-13x9mm olive with flower design. Sold per pkg of 4. 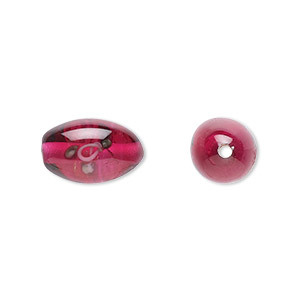 Bead, Czech lampworked glass, opaque red / pink / green, 12x8mm-13x9mm olive with flower design. Sold per pkg of 4. Bead, Czech lampworked glass, opaque brown / pink / green, 12x8mm-13x9mm olive with flower design. Sold per pkg of 4. Bead, Czech lampworked glass, opaque pink and green, 12x8mm-13x9mm olive with flower design. Sold per pkg of 4. 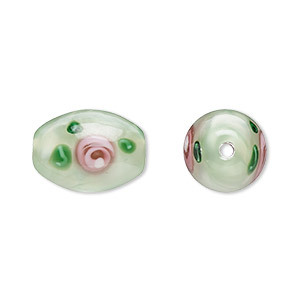 Bead, Czech lampworked glass, opaque white / pink / green, 15x10mm-16x11mm olive with flower design. Sold per pkg of 2. Bead, Czech lampworked glass, opaque blue / pink / green, 12x8mm-13x9mm olive with flower design. Sold per pkg of 4. 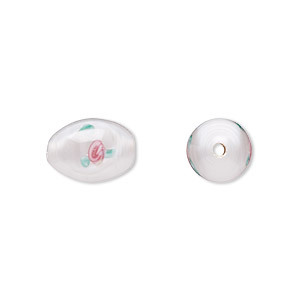 Bead, Czech lampworked glass, opaque white / pink / green, 9x6mm-10x7mm olive with flower design. Sold per pkg of 4.